RRB NTPC Document Verification Admit Card 2017 – Download Railway DV Call letter for ASM, Goods Guard, CA/ TA & Clerk: RRB CEN 03/2015 Document Verification Admit Card goes available for download. Are you going to appear at RRB NTPC DV 2017? 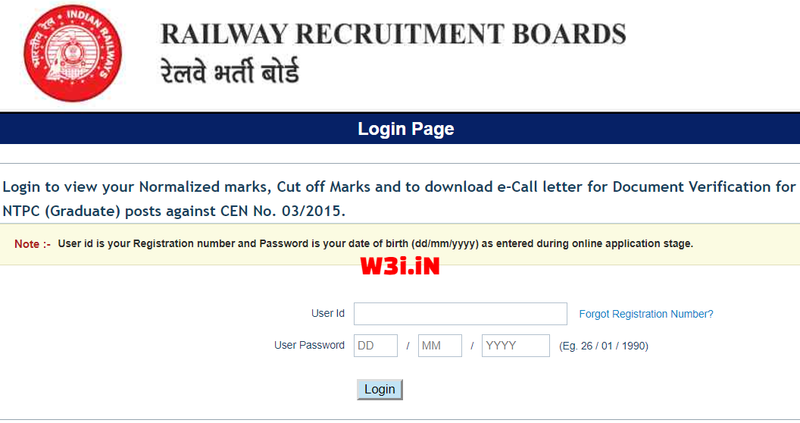 You can now download your RRB NTPC Admit Card for Document Verification for Railway. Update: RRB NTPC Document Verification admit card can be downloaded from 12 August 2017. All Railway Recruitment Boards (RRBs) are all set to conduct Document Verification for Non Technical Popular Category (NTPC) Graduate Category examination to be held on 28th August to 6th October 2017. RRB had issued NTPC recruitment notification for 18252 14023 Asst Station Master, Goods Guard, Traffic Apprentice, Commercial Apprentice, Junior Accounts Asst and Senior Clerk vacancies against CEN 03/2015 in December 2015. Good news for all RRB NTPC applicants, they will soon be able to download their RRB NTPC 03/2015 Admit Card online. Candidates who had applied for Railway ASM, Goods Guard exam and they have been decalred as qualified for 2nd Stage of RRB NTPC exam will be sent call letter to attend RRB NTPC Document verification 2017. Certificates Required for RRB NTPC Document Verification. RRB NTPC Document Verification will be held from 28th August 2017. Link to download Admit card for all eligible candidates for online examination will be activated before 9th June 2017. If you are willing to appear at Railway ASM, Goods Guard Document Verification, you first need to download RRB NTPC DV Admit card. Here is a quick guide on how to download RRB CEN 03/2015 Admit Card 2017. Follow the instructions given below to download your RRB NTPC DV Admit Card. Log on to RRB Respective Website. Search for “Admit Card” Section. Now Enter User ID and Password (Registration No. & Date of Birth). N new page will be open with your Admit Card on it. All details i.e. Exam Date, Exam Center and Time will be mentioned there. Download it and Take print out of RRB NTPC Admit card. Candidates are hereby recommended to keep prepare for exam and be ready for RRB NTPC Document Verification 2017 and it is going to be started from 28th August 2017. Candidates are strongly advised to keep visit this page on regular basis until they download their RRB NTPC DV Admit Card 2017. We will update this page and bring you RRB 03/2015 Document Verification Admit card of Non Technical exam once it is officially released by concerned Railway Board. Follow the link given above to download Railway ASM, Goods Guard DV Call letter 2017. Certficate for Railway Document Verification.